Visit www.drivechipandputt.com for more information or to register your child. Registration opens March 5, 2019. 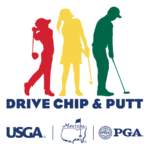 Download 2019 Schedule (pdf) find photos on our Facebook page Get ready with Drive, Chip & Putt Clinic!